September 09, 2018 at 6:37 pm. 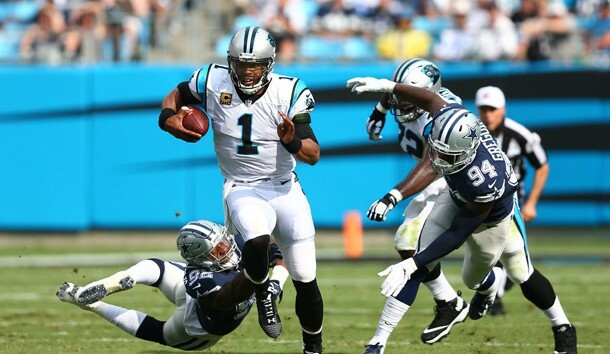 The Carolina Panthers opened the NFL season at home for the first time since 2013 against America’s Team, the Dallas Cowboys, and came away with a hard-fought 16-8 victory. The win was the first for new Panthers’ owner David Tepper and he was awarded the game ball when it was over. The story of this game was defense. After a scoreless first quarter, Carolina got on the scoreboard with 8:50 remaining in the second quarter on a four-yard touchdown run by Cam Newton. The touchdown drive was set up by Panther Damier Byrd’s 30-yard punt return, giving Carolina the ball at the Dallas 35-yard line. The Panthers put together a drive just before halftime, but had to settle for a 27-yard field goal by Graham Gano on the final play of the half to extend the lead to 10-0. The Cowboys offense could not get on track and did not cross midfield until late in the third quarter. Dallas had its first chance to score with 2:38 to go in the third quarter, but Brett Maher missed a 47-yard field goal. After the missed Dallas field goal, the Panthers were able to march 63 yards and scored on a one-yard run by FB Alex Armah. The touchdown was Armah’s first touchdown of his career. The PAT was no good and Carolina lead 16-0. In the fourth quarter, Dallas finally put together a 10-play, 75-yard drive climaxed by a Ezekiel Elliott’s 4-yard touchdown run and quarterback Dak Prescott ran in the two-point conversion to cut the Panthers lead in half to 16-8 with 8:51 remaining in the game. The Carolina defense stepped up in a big way and stopped two Dallas drive attempts to tie the game in the final 6:00. With less than a minute to go, Panthers DE Mario Addison sacked Prescott and stripped the ball away and Panther Captain Munnerlyn recovered to kill any Dallas hopes of a comeback. Carolina then was able to run out the clock. The win could be costly for the Panthers as they lost two Pro Bowl players, Greg Olsen and Daryl Williams to injuries and they did not return. Carolina LB Luke Kuechly was also injured, but returned later in the game.